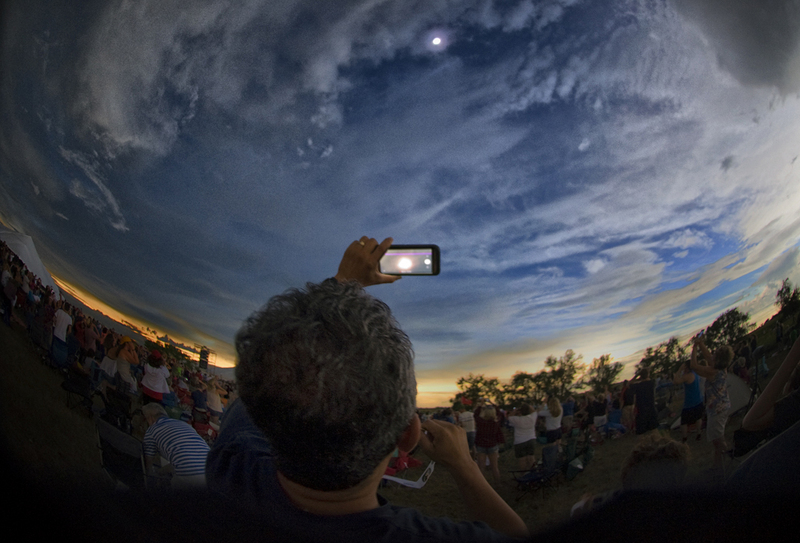 A viewer records the sun as it begins to unmask during the total solar eclipse while sunset surrounds the horizon. Darkness settles over Homestead National Monument of America during the total solar eclipse in Beatrice, Nebraska. The moon blocks out the sun over Geneva, Neb., for a total solar eclipse on Monday, Aug. 21, 2017. 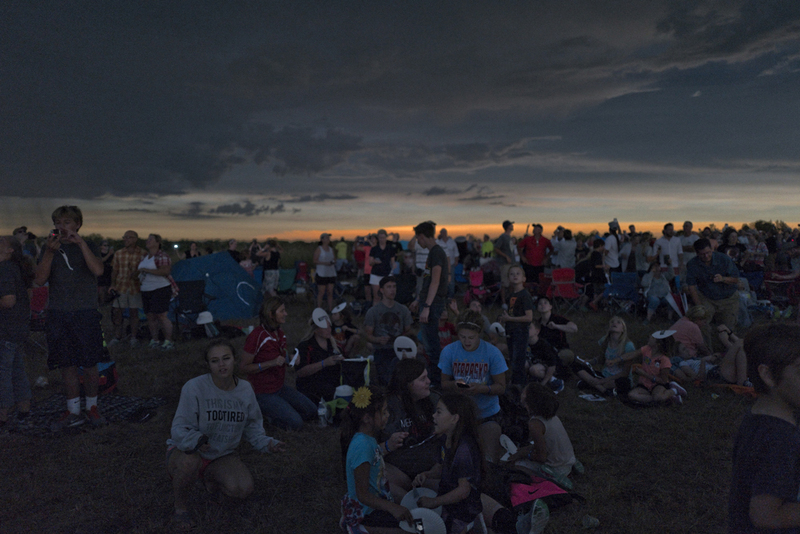 Thousands flocked to the town of of 2,200 near Omaha — and many other U.S. towns and cities in the “path of totality” of the solar eclipse — fighting traffic and cloud cover. But the clouds cleared in time for a spectacular view of the heavens, promptly at the right time, just after 1 p.m. Central Time. 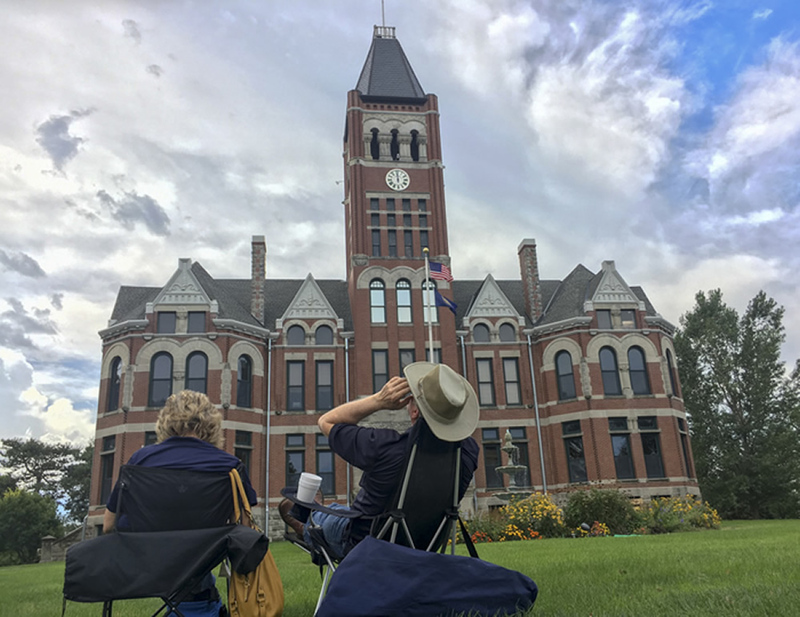 A couple relax in front of the historic Fillmore County Courthouse in Geneva, Neb., waiting for the solar eclipse on Monday, Aug. 21, 2017. 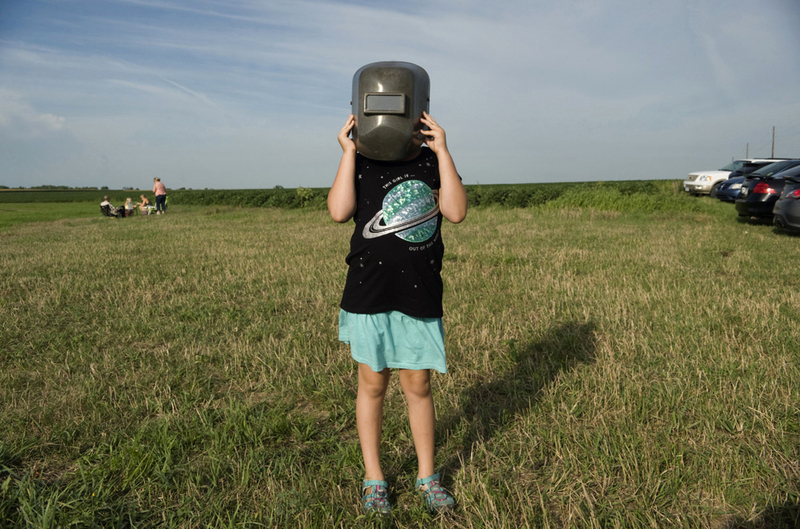 Thousands flocked to the town of 2,200 southeast of Omaha — and many other U.S. towns and cities in the “path of totality” of the solar eclipse — fighting traffic and a little cloud cover. But clouds cleared in time for a spectacular view of the moon blocking out the sun about 20 minutes before the 1 p.m. Central Time totality. 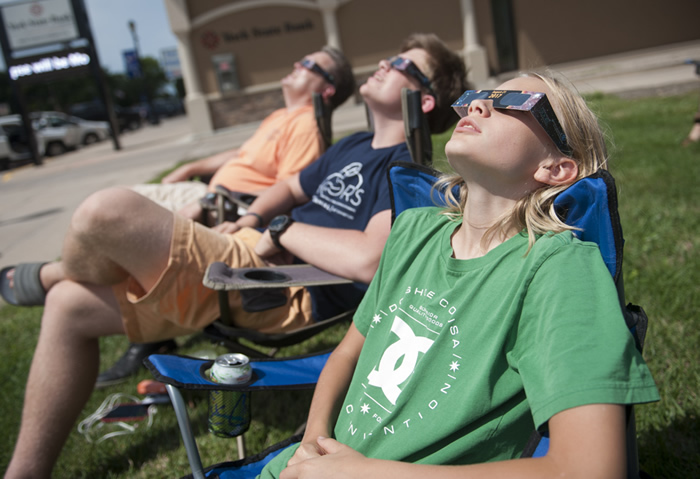 From left, James Dungan-Seaver, his son Simon Dungan-Seaver, 17, both of St. Paul, and Sean Lassig, 12, of Minneapolis peer through their protective glasses to see the moon overtaking the sun and just before totality, on a main street of Geneva, Neb., on Monday, Aug. 21, 2017. 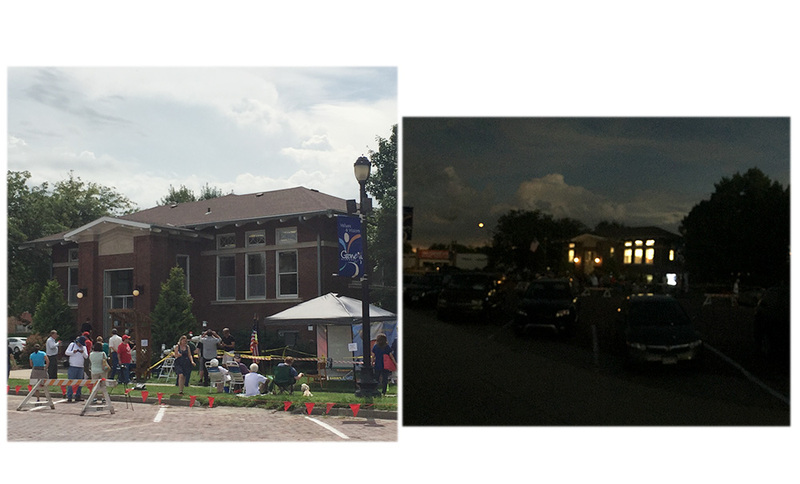 Cloud cover and eclipse-related traffic jams threatened, but all cleared in time for the 1 p.m. cosmic show. 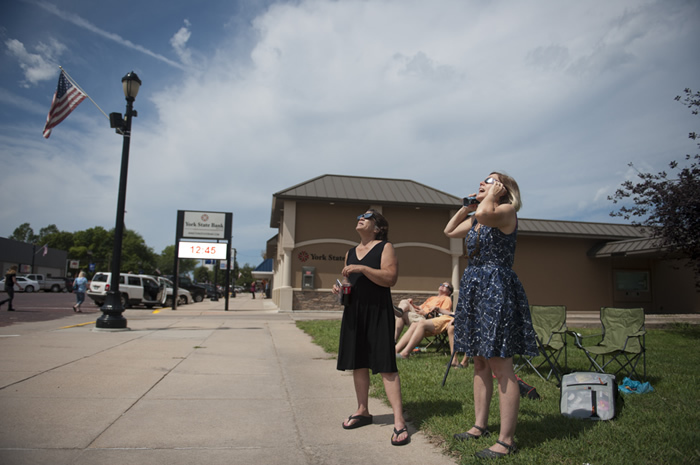 Sherry Morris of Fargo, N.D., left, and Lisa Legge of Minneapolis peer at sky as the sun begins to overtake the moon and just before the great 2017 eclipse, near a main street of Geneva, Neb., southwest of Omaha, on Monday, Aug. 21, 2017. 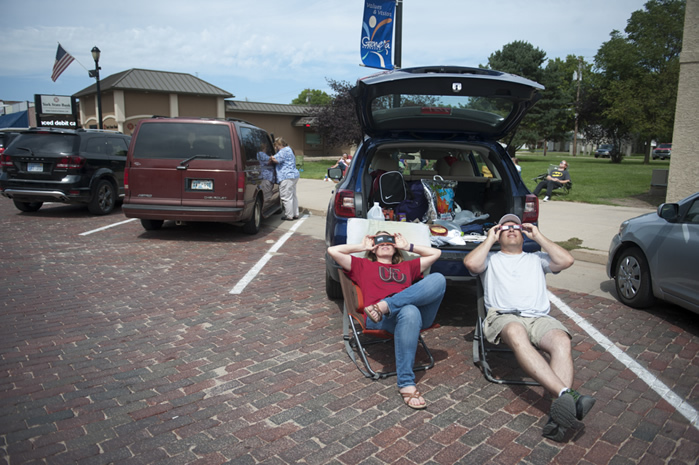 Michelle and Gerry Giese of New Mexico wait with their protective glasses for the solar eclipse totality on the main street of Geneva, Neb., on Monday, Aug. 21, 2017. They were among millions who migrated to U.S. towns and cities in the “path of totality” of the solar eclipse. 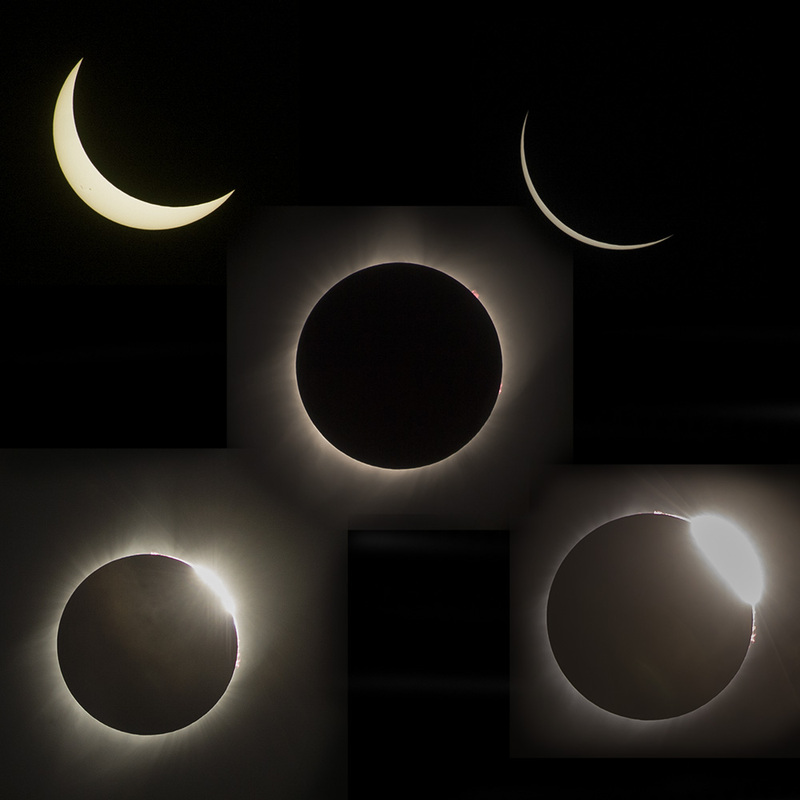 The Omaha World Herald reported that some 500,000 were expected in that state’s portion of the totality; traffic was backed up between Lincoln and Omaha both morning and afternoon after the eclipse. From day to night in seconds.